Since winning the Best Adapted Screenplay last year for The Social Network, Hollywood scribe extraordinaire Aaron Sorkin has been rather ubiquitous in the public eye. He followed that excellent Facebook drama by co-writing the equally commendable Moneyball, and recently he signed on to pen the non-Ashton-Kutcher biopic about Steve Jobs. Yet neither one of those projects has us as enlivened as Sorkin’s big-deal return to the small screen, The Newsroom. Clearly inspired by the cinematic classic Network, Sorkin’s intelligent dramedy series details the inner workings of a fictional cable news channel, where the traditionally safe anchor, Will McAvoy (Jeff Daniels), after snapping on the air, begins a truth-telling mission with his imaginary gloves off. 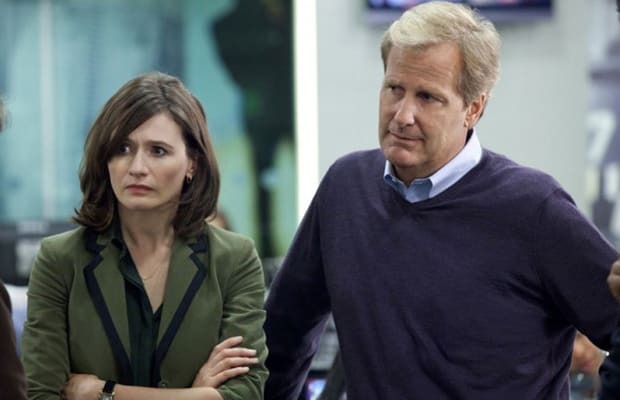 Like all of HBO’s series, The Newsroom surrounds its lead with a colorful and intriguing supporting cast, namely the underrated Emily Mortimer (Shutter Island, Hugo), the whipsmart Alison Pill (Scott Pilgrim vs. the World, Midnight in Paris), and Olivia Munn (your wildest fantasies). But it’s clear who the real one-two punch consists of here: Daniels, who finally has a dynamite role to own after years of second-tier work, and Sorkin, a snappy, brainy writer ready to unleash his scathingly funny brand of social commentary onto Sunday night audiences. —M.B.